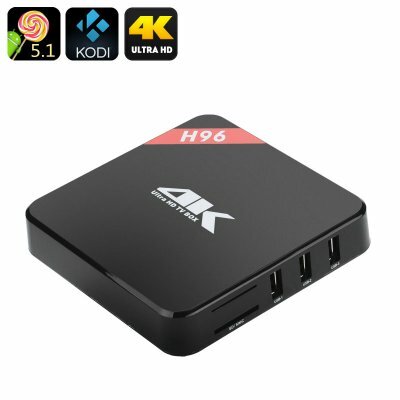 Successfully Added Android 5.1 TV Box - 4Kx2K, Quad Core Amlogic S905 CPU, Wi-Fi, DLNA, Miracast, Airplay, Kodi 15.2 to your Shopping Cart. Comes with Kodi preinstalled - enjoy loads of great content! Enjoy a better TV experience with the Android 5.1 TV Box, coming with 4Kx2K supported resolution, quad core processor, DLNA/Miracast/Airplay support and more. Get an instant upgrade for your home entertainment with the compact Android 5.1 TV Box, that supports 4Kx2K video playback. Enjoy a clean and friendly Android interface on the big screen with all the latest upgrades and hit the Play Store for more fun apps and games. You will have 8GB of internal memory + 32GB supported externally. With Kodi 15.2 already there, you will have a great media player at your service + access to loads of free media content. Enjoy! With 4 USB ports and SD card slots, you will have plenty content sources to choose from. Sharing options are also extensive thanks to DLNA, Miracast and Airplay support. There is even SPDIF for quality audio output to your home audio setup. A handy remote control comes included and you be able to easily navigate your Android TV. The Quad Core Amlogic S905 processor ensures smooth multitasking and fast operation speeds. With a simple minimalistic design, the TV box will be a discreet, yet powerful addition to your home entertainment system. The Android 5.1 TV Box comes with a 12 months warranty, brought to you by the leader in electronic devices as well as wholesale Android TV boxes..